INTRODUCTION: Starting with Tyrant, Christian Cameron has become the preeminent writer of our time for historical fiction set in Classical Greece and he has been getting only better in both style and structure - the research was always there as was the atmosphere and the larger than life characters but the first two books had the occasional narrative wall and structural problems like the prophecy that essentially forced Tyrant: Storm of Arrows into a bit narrower narrative space than it should have been. When the Long War series was announced in 2010 with its first person narrative from Arimnestos - historical and legendary personage of the Persian wars - each volume became one to get and read on publication, while also each subsequent installment only increased the depth of the series and my appreciation 0f it. As I have not reviewed here the first two books, I decided to present all three reviews of Killer of Men, Marathon and Poseidon's Spear as done on Goodreads at the time of their reading in the first two cases with a few extra comments from today. Arimnestos is a farm boy when war breaks out between the citizens of his native Plataea and their overbearing neighbours, Thebes. Standing in the battle line for the first time, alongside his father and brother, he shares in a famous and unlikely victory. But after being knocked unconscious in the melee, he awakes not a hero, but a slave. Betrayed by his jealous and cowardly cousin, the freedom he fought for has now vanished, and he becomes the property of a rich citizen. So begins an epic journey from slavery that takes the young Arimnestos through a world poised on the brink of an epic confrontation, as the emerging civilization of the Greeks starts to flex its muscles against the established empire of the Persians. As he tries to make his fortune and revenge himself on the man who disinherited him, Arimnestos discovers that he has a talent that pays well in this new, violent world - for like his hero, Achilles, he is 'a killer of men'. 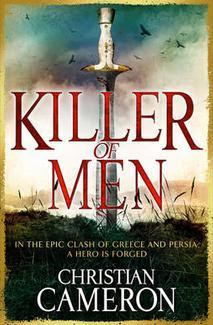 Killer of Men is a first person narration from Arimnestos of Plataea as told to his young daughter and her companions, in the hero's old age when he seems to be a noble of some sort in Thrace. The book covers his childhood as a member of a leading family of Platea - his father is a renowned smith, important citizen and a sort of client of Miltiades, famous Athenian aristocrat and Black Sea warlord and pirate, while his mother is of the Greek aristocracy herself but a bit unhappy as wife of a commoner - his training under an old soldier and killer of men himself and later his beginning soldiering in a week of three battles when the Athenians and the Plateans face three enemy armies and defeat all. However, young Arimnestos is wounded, betrayed and sold into slavery to Ephesus where by chance he is taken by rich merchant and poet Hyponnax as companion to his son Archilagos. Here he grows to manhood in a sort of "luxury slavery" studying under Heraclitus and deepening his military skills as bodyguard to Archilagos and sort of tolerated companion to some local Persian officers. Overall I am in for the duration of the series of course and I highly recommend it. "Arimnestos of Plataea grew up wanting to be a bronze-smith, like his father. Then, in the chaos of war, he was taken to a city in the Persian empire and sold as a slave. To win his freedom he had to show that he could fight and kill. Now, to preserve that freedom, he must kill again. For the Persians are coming. A vast army sent by King Darius to put down the rebellious Greeks and burn the city of Athens to the ground. Standing against them on the plain of Marathon, a much smaller force of Athenians, alongside their Plataean allies. To defeat such overwhelming force seems impossible. And yet to yield would mean the destruction of everything the Greeks have dreamed of. In the dust and heat of Marathon, in the clash of shields and the rush of spears, amidst the thunder of hooves and the screams of the dying, those dreams will undergo their fiercest test - and Arimnestos and his Greek comrades will discover the true price of freedom." (2011 rv) I finished Marathon after a complete rereading of Killer of Men to get in the spirit of the series and while I liked it a lot, it stopped a little short of blowing me away and I think that Killer of Men is a better book overall; trying to think why - since the writing is very good, the atmosphere pitch perfect as usual and the voice still the same Arimnestos of the series debut with the powerful cast from there - I think that the main reason is that Killer of Men was structured after the hero, while Marathon is structured after historical events and because of that it becomes more rigid and predictable (note 2012: after this year's reread of Marathon and its continuation in Poseidon's Spear the book also jumped a notch to my top 25 list of 2011, though I still slightly prefer Killer of Men as the above reason remains pertinent). 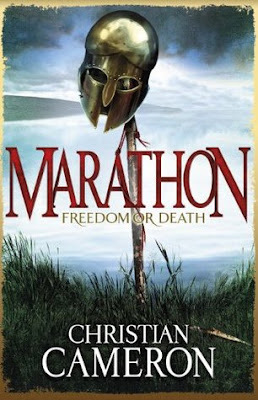 Also Marathon: Freedom or Death is slightly a misnomer since the novel is about two major battles, each taking about half the book including of course the periods up to it. Starting where Killer of Men ends with Arimnestos back home, there is a stretch of passing time and then the hero's return to action under Miltiades is a also a bit contrived, but the part from there to the battle of Lade and its aftermath is superb and that - maybe a third of a book - is what I expected the novel to be and a blow me away narrative. After Lade, there is another stretch of passing time and while things happen, the tension is simply not there and Arimnestos becomes a pretty awkward narrator on occasion. Then there is the lead up to Marathon and the battle itself and here for some reason I felt the tension from Killer of Men or from the battle of Lade was somewhat lacking and a lot of the action read somewhat repetitive and a bit by the numbers. I am still very interested in the series and look forward to following Arimnestos' tale! "Arimnestos of Plataea is a man who has seen and done things that most men only dream about. Sold into slavery as a boy, he fought his way to freedom - and then to everlasting fame at the Battle of Marathon where the Greeks crushed the invading Persians. Sometimes, however, a man's greatest triumph is followed by his greatest sorrow.Returning to his farm, Arimnestos finds that his wife Euphoria has died in childbirth, and in an instant his laurels turn to dust. But the gods are not finished with Arimnestos yet. With nothing left to live for, he throws himself from a cliff into the sea, only to be pulled by strong arms from death's embrace. When he awakes he finds himself chained to an oar in a Phoenician trireme. And so begins an epic journey that will take Arimnestos and a motley crew of fellow galley slaves to the limits of their courage and beyond the edge of the known world, in a quest for freedom, revenge - and a cargo so precious it is worth dying for." 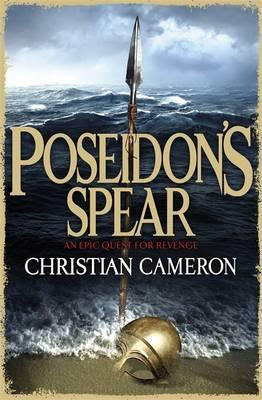 Poseidon's Spear has been a novel that was simply impossible to put down the first time and one I reread immediately again at leisure, while also going back to the earlier two novels to stay in their universe. The book follows Arimnestos from the Marathon aftermath in 490 till about half way to Thermopyle and Salamis in 480, so till about 485. The beginning part which may seem a little contrived from the blurb, works very well and the description of the hellish life of a galley slave on a Carthaginian vessel is as vivid and harrowing as it ever gets. After that, Poseidon's Spear becomes almost a tour through the western part of the "known world" at the time, part that was generally under strong Carthaginian influence due to their powerful war fleet and control of the Gibraltar. The book is largely sea action, though there is a lot land action too, romance, intrigue, slavery and we travel to Sicily, Rome, Etruria, Spain, Gaul, Ilyria and even Britain only to come full circle and prepare the return to Plataea and the war. Arimnestos breaks one more heart, marries one more time, meets Pythagoras' daughter and current leader of her father's philosophical school and still dreams of Briseis who has also gone to even greater things from wife of the leader of the (failed) rebellion of Asia Minor, to wife of an even more powerful Persian satrap, while (of course) still having the time and inclination for the occasional fling with Arimnestos. With a great ending to boot, Poseidon's Spear is a top 25 novel of 2012, while the next installment of this series cannot come soon enough.